New Ghostbusters Trailer Isn’t Sure What It Is! So the first official trailer for the upcoming Ghostbusters reboot landed, and it’s pretty disappointing. The trailer starts out very promising, reminding us that 30 years ago, this franchise began. There is a beautiful hint of the original film’s theme. Then, it goes on to show that this film is likely to be a note-for-note less interesting retread of the original film. SO help me if they do damage to Zuul or the Stay-Puft Marshmallow Man! Seriously, they director Paul Feig (The Heat) didn’t see a problem making all these characters sound the exact same and even shoehorning the black character as the one who drives them all around. Then, there’s the issue of the CGI. I don’t mind a CGI-fest if it suits the film. So far, I’m not convinced that this iteration will embrace the horror elements that made the first two films so popular. But the most irksome part of this trailer…I’m not sure if this film knows how to market itself at all. Is this a sequel or a remake? The beginning says one thing; the ending another. I would prefer a reboot that continues the story. It makes the film feel less lazy, and you have the ability to include cameos and hints without forcing the new story on anyone. The new Ghostbusters doesn’t have a lot to promise if the trailer is any indication. I’m sorry to say it. In fact, it hurts to say it. I’ve been saying for years that this franchise could have a lot of steam to it, and now I’m not so sure. So what do you think? 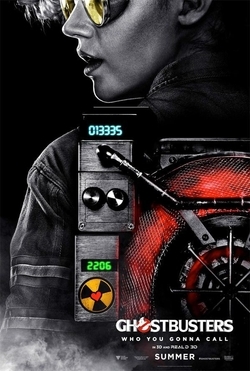 Have you seen the Ghostbusters trailer and what did you think? Which 1980s franchise would you like to see rebooted for the new generation? Check out the trailer below, and let me know! Ghostbusters stars Kristen Wiig and Chris Hemsworth and slimes onto screens July 15th. New Angry Birds Trailer Gives Us More Story!